At around 10am on April 2nd nearly a thousand demonstrators converged on the Belgian Minister of Health’s office. It was a matter of submitting an alternative health policy to the Minister, supported by several Belgian organizations (trade unions, mutuals, NGOs, federations). This is a uncommon occurrence, though possible due to the convergence of positions leading up to the Belgian elections. From there, the demonstration, reinforced by the presence of delegations from several European countries including the Netherlands, Spain, Italy, France, Croatia, Slovenia and Ireland, rallied at the European Parliament, Place du Luxembourg, carrying slogans such as: "Commodification seriously damages health", "Our health is not for sale", or "I was diagnosed with an unprofitable disease, no luck!". The European Network against the Privatization and Commercialization of Health and Social Protection, at the helm of this initiative and organizing the activities of the day, welcomed the determination of the participants who braved the wind and rain. After a series of speeches on the Place du Luxembourg and the symbolic signature by several European parliamentarians of a Pledge, in which they undertook to defend 6 axes in favour of accessible health for all, a conference was held in the European Parliament in support of the Pledge. The European Parliament, literally, came out of its walls on April 2nd: not only did the parliamentarians come out to sign the Pledge and explain their commitment to demonstrators but the entire conference was broadcast on a big screen for all the demonstrators who could not be a part of the audience inside Parliament. During the conference, academics, associations, trade unionists, Members of the Parliament and members of the European Network gave a series of speeches painting the very dangerous picture of the commercialization of health and social protection, which has been at work for decades in most European countries. At the same time, the speakers defended a social Europe in which the economy should be instrument at the service of the implementation of political decisions in favour of the well-being of populations. The European Network applauds the thirty or so Members of the European Parliament and candidates from 12 different countries who have already signed the Pledge and are resolutely committed to the defence of non-commercial health and social protection. The European Network will continue its campaign for politicians–not only candidates but also national elected representatives–to sign the Pledge in order to make health and social protection key issues in these elections. The European Network also directly addressed the first signatories of the Pledge, making it known that it will be very attentive to their upcoming debates and votes. The European Network will support their action if they respect the Pledge and make it known if they do not so that the signing of this Pledge is more than a just promise but a real commitment. At the call of the European Network and its associated structures, this week from 1 to 7 April (World Health Day) is marked by actions, demonstrations, conferences and debates in many European countries. It will also be an opportunity to continue the signature campaign and to join in the ongoing struggles in various countries to defend and promote a universal, high-quality, non-commercial health and social protection system accessible to all. They are outgoing deputies or candidates for the European elections, or parliamentarian at the national level. 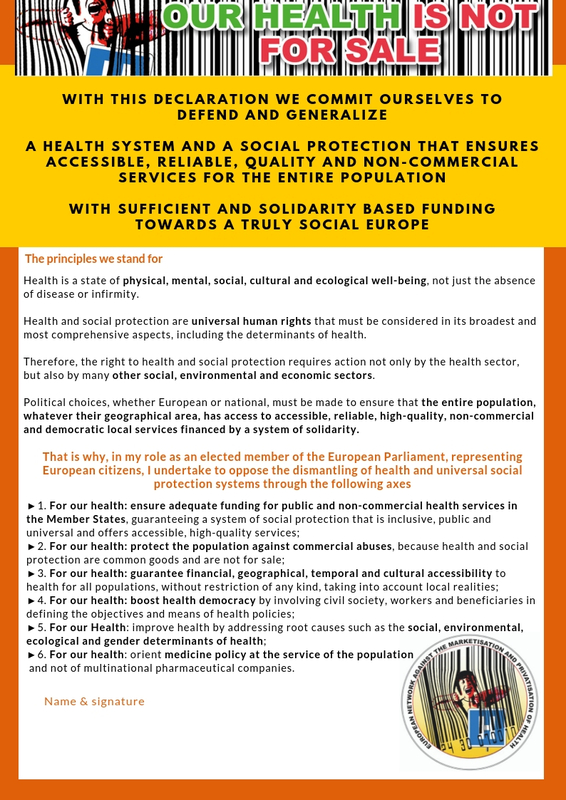 By their signature they commit themselves to defend and generalize a health system and social protection that ensures accessible, reliable, quality and non-commercial services for the entire population; with sufficient and solidarity based funding, towards a truly social Europe. The day of 2 April is not an end in itself but the beginning of a process of interpellation of the candidates that will continue beyond 26 May in all countries. The European Network will be vigilant throughout the legislature, and will remind signatories of their commitment whenever necessary.